Last year's summer in California continues to inspire us! 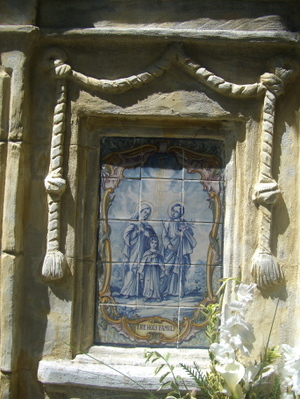 One of the things we remember well, particularly in Mission Carmel, was the wide variety of blue and white tiles featuring devotional scenes. 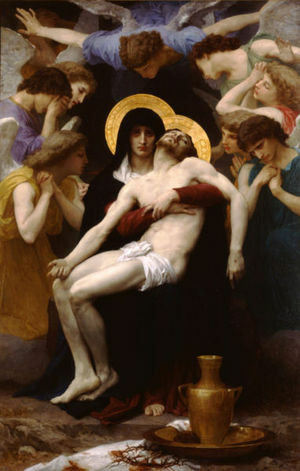 We also admired the Pieta by Adolphe-William Bouguereau, a larger-than-life painting standing floor to ceiling against a wall of the Legion of Honor Art Museum in San Francisco. 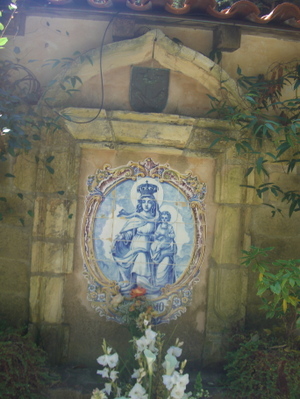 These images and memories formed the inspiration for a simple springtime project--"Blue and White Tiles for Our Lady." 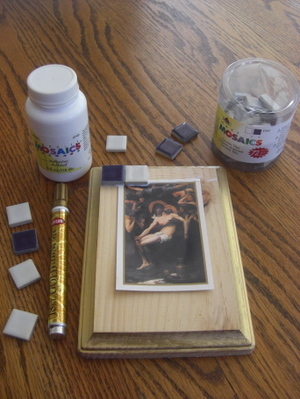 We began with a wooden plaque, holy card, container of tiles, tile glue, and a gold-leafing pen. 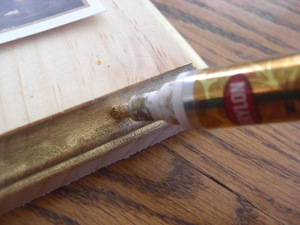 It only took about two minutes to gild the edges. 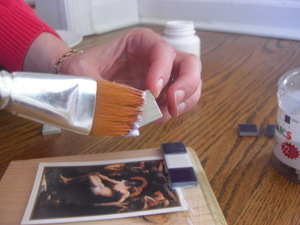 After planning the location of the tiles, a special glue was brushed on the wooden surface and the back of each tile square. Gluing the tiles did not take long at all. Knowing it might take a month or more before we return to the craft store, I decided to post the project as is, because it is quite pretty already. I am thinking about turning it into a holy water font eventually or putting it on the front door. Whether or not I ever get around to putting grout in all those cracks! What a beautiful project! Thanks for sharing. Ah, we just saw those pictures at Carmel in person a few days ago! :) And Blue and White is my favorite. Thanks for sharing! Was that a year ago already? Oh my. Oh you need to come back to California soon!! A year is way to long, San Francisco and the fog is missing you. I was at the craft store today - but shall have to return at the beginning of the week, after seeing this! How lovely that would look on your door. I think it's a beautiful project just as it is! Alice, those photos from the mission are just SO beautiful! I just had to put the image of Our Lady of Mount Carmel on my desktop! Your craft activity was very inspiring as well, thank you for sharing it! What a lovely craft! And it could be adapted in so many different ways - how fun. 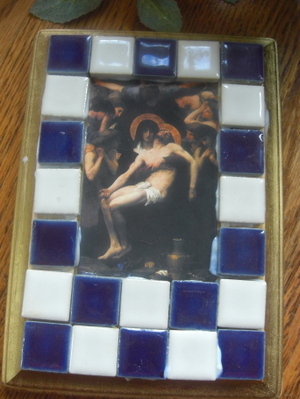 Excellent project -- this would be ufn to do a "Kitchen Madonna" in tiles to match the kitchen! What a smart crafter you are, Alice! What a great idea. It's beautiful. Another great craft idea, you never disappoint! So pretty! 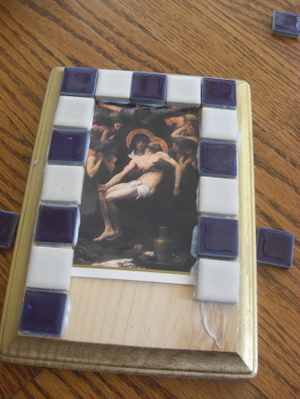 I just read the Kitchen Madonna and agree with Mary G that this would be a great take-off on that sweet book.